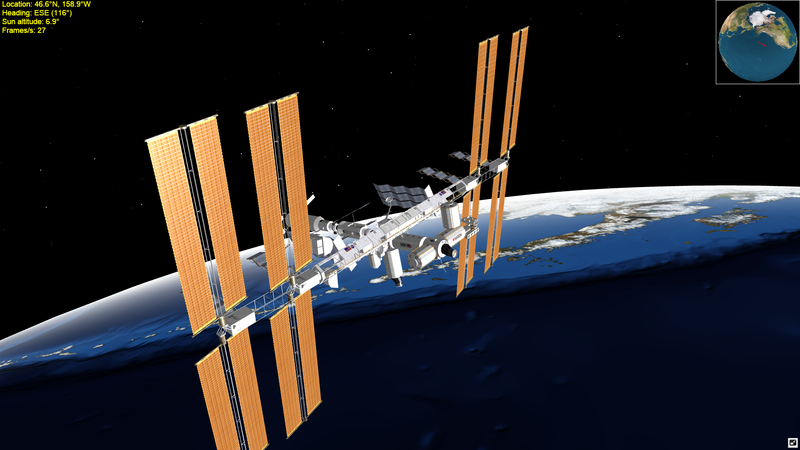 This is our new 3D visualization of the ISS, please see below for instructions on how to use it, a list of features, and tips in case it does not display on your browser. Drag the viewpoint with the mouse whilst holding down the left button. Zoom in and out from the ISS using the mouse wheel. Use the button at the bottom right of the display to enter fullscreen mode. 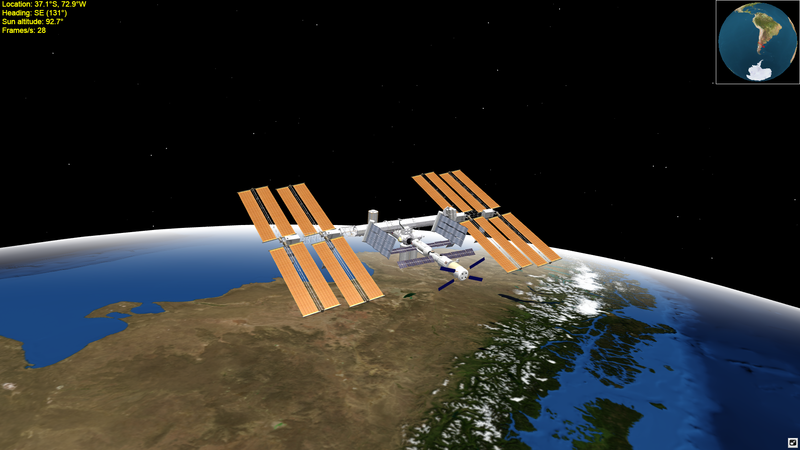 3D ISS model with solar panels which rotate to track the Sun (model accuracy will be improved in future release). Earth model with high resolution surface texturing which changes with the seasons to show changing snow cover etc. ISS illumination changes to diffuse red lighting when not illuminated by the Sun. Inset view showing position relative to whole Earth for better orientation. This visualization uses WebGL, which is a relatively new technology and is only supported by modern browsers. Furthermore, it uses hardware acceleration provided by the graphics card in your PC, so you need to have a reasonably good graphics card or the display will update only slowly. You can get an idea of the speed from the frames/s value which indicates how many times per second the display is refreshed. We artificially limit this to 30 fps, as this is perfectly adequate for this type of display. If you cannot see the display at all, make sure WebGL is enabled on your browser, and make sure your browser is up-to-date. Internet Explorer users should make sure they have version 11 or higher. For iPad/iPhone users, please make sure you have iOS version 8 or higher, because WebGL does not seem to be supported on earlier versions.